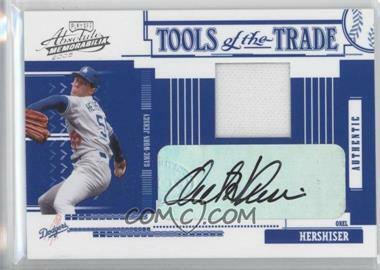 One of the “selfish” reasons why I built this website was so that I could collect Orel Hershiser cards more easily. Yesterday I acquired this Hershiser card. As the site continues to grow, I hope more collectors out there can find gems of their favorite players, just like I found here. It doesn’t get much better than a 1/1 signed jersey card of your favorite player. This entry was posted in baseball cards, personal life. Bookmark the permalink. That’s a great card! I’m always looking for Alonzo Mournings. My plan is to buy every one off the site eventually. But theres a really sweet one but it’s 140 bux…ouch! Glad I could help out especially since this website has helped me out so much by finding another avenue to get “rid” of some cards! Orel Hershiser’s brother was a news anchor in the 90’s in my hometown of St. Joseph, MO just north of Kansas City after his brief Baseball career. Gordie!!! Great guy, easy to talk to and spitting image of his brother. Had lots of his brother’s memorbillia he gave out. I’ll have to dig up some of the cards he signed and gave us, but we didn’t personalize a lot because Orel was a great ball player, but wasn’t an in-demand star in our area.